Happy Friday! Today concludes Nature Week for the Digit-al Dozen and I am sad to see this one go! (My body will be glad though because now I will be able to sleep more! LOL) This week gave me a lot of inspiration and I'm hoping to take that forward and build on it. 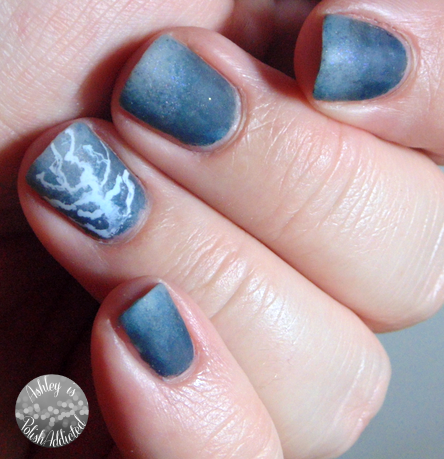 Today I am taking inspiration from one of my very favorite things - thunder storms! Living in the desert I obviously don't get a lot of rain or storms but they are my favorite weather. I could live somewhere where it rains most of the time and I would be a happy gal. However, during the hottest part of the year - typically middle/end of June to end of August - we have "monsoon season." In Arizona monsoon season means higher humidity (so during the hottest part of the summer it is not a dry heat like most people think), massive dust storms and rain storms. When I was a kid up through a few years ago we typically had rain pretty often during monsoon season but during the last few years it's not rained as much and we get dust storms and a ton of lighting. And I have to say, Arizona does have some of the most wicked looking lighting, it's pretty amazing. 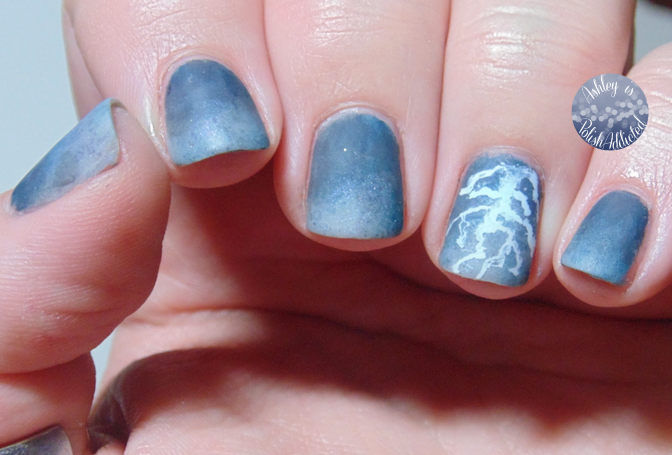 This manicure didn't turn out quite like I wanted it but overall I'm pretty happy with it. I did some complexing "dabbing" - one of my favorite things to do - to create the base. It has a lot more depth in person that it looks like in these photos. I used all Elevation Polish polishes to create the base (have I mentioned that my Elevations are my favorites for nail art??) and I will list them below. 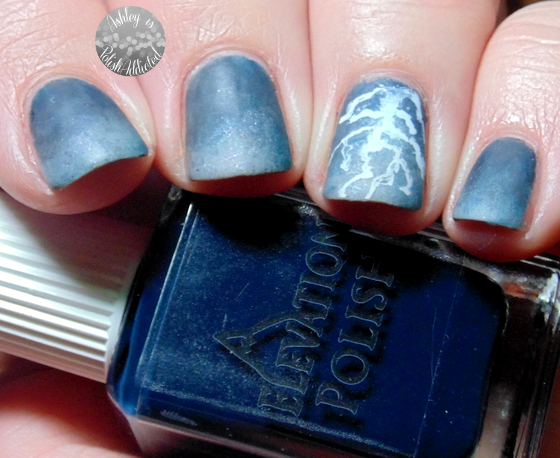 I used acrylic paint for the lighting, KBShimmer Clearly on Top and Wet 'n Wild Matte top coat to finish it off. I hope you enjoyed Nature Week as much as I did! Make sure to check out the amazing manis below and we will be back next month with a new theme! Ooooh I love this one! 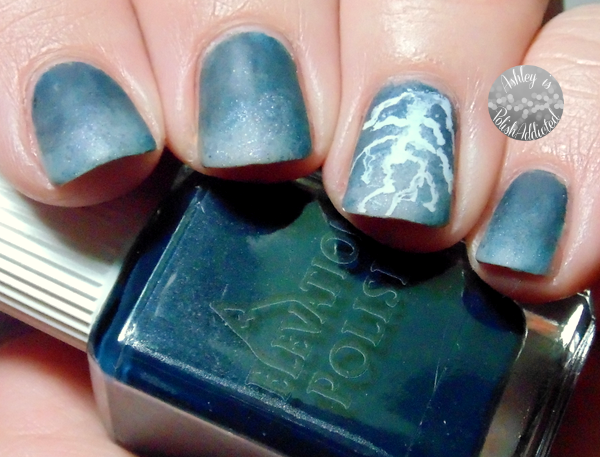 Your lightening is great!!!!! I love storms as well! We get a ton of them in the springtime and it makes me so happy! Nothing better than curling up on the porch with a kitty, a cuppa and a good book during a storm! Oh, I like this. Very creative! Very mysterious! I love the storms in Arizona, unless I'm driving in them, then they scare me!